Blade construction : Shinogi-zukuri, Iori-mune. Single-handed designed and referred to as Katate-uchi 片手打ち. Wide in Minaha, holding a shallow sori, a bit on stronger degree of tapering from base to tip that ends in an compact medium Chu-kissaki. Bō-hi groove in front and a pair of Futasuji-hi grooves in Ura side. Entire blade is assumed to preferences in swrodsmanship for trusts rather than cuts that appeared with the Kanbun era (1661-73) referred to as Kanbun-shinto style 寛文新刀姿. Forging (Hada) : Jigane steel is a bit on darkish blue side. Hada is conspicuous Itame and entwined swirling grain marks appear on Hiraji side and Straight Masame appears both on hardening boundary line and Shinogi-ji side. Profuse martensite crystals Ji-nie appears against well refined bluish Jigane to generate black gleaming lines of Chikei all over the surface. Temper (Hamon) : Hamon is a rather on stronger side martensite crystals Nie-based, starts with short Edo-yakidashi, shallow undulating Notare with tall head Gunome that ranges regularly like a Juzu prayer beads. Boundary line is abundant with prominent martensite crystals of Nie. Upper the blade, stronger the Nie crystals and wider the temper. In the mist-like crystalline area, thick Ashi emits sparkling light toward the cutting edge and short lines of Nie Sunagashi and bright curved threadlike Kinsen areas sparkles in the hardening boundary line. Temper of tip (Boshi): It becomes the strongest Nie crystals, wider the temper to form gleaming long lines of Nie in flames with an indication of intense Hakikake and small circle turns back. Tang(Nakago) : UBU original. Yasurime starts with horizontal Kiri file marks in Suridashi area, greatly slanting left Ō-sujikai. The heel shape is Uneven U-shape of Ha-agari KURIJIRI. The peculiar writing of signature is located along the Shinogi-suji ridge that reads Kazusa-no-suke Fujiwara KANESHIGE 上総介藤原兼重. Kazusa-no-suke Fujiwara KANESHIGE 上総介藤原兼重 is one of the most prominent makers during Kanbun era (1661-72) in capital Edo, said a son of the first gen. Izumi-no-kami KAENSHIGE 和泉守兼重, real name Tsuji Suke'emon 辻助右衛門, born in Echizen domain (now Fukui pref.). He has an honor as "Jo-jo-saku" above superior made for artistic value also with a great honor of reputation for "Yoki-wazamono" supreme sharp cutting performance. It is said that KANESHIGE of both parent and son worked for the feudal lord Toudo 藤堂家 in Ise domain on recommendation of the great swordman Miyamoto Musashi 宮本武蔵. His supposed hesitation to use his initial title of "Izumi-no-kami" to have changed conclusive to "Kazusa-no-suke" was because master feudal lord Toudo Takatora 藤堂高虎 had the official district title "Izumi-no-kami". 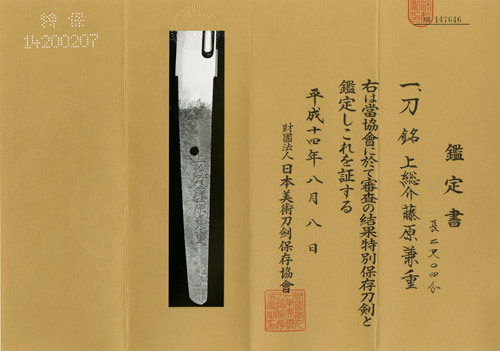 It is an influential opinion that Kazusa-no-suke KANESHIGE was a master of Nakasone-kotetsu 中曽祢虎徹 from the same town Echizen with an essential characteristics of strong Itame forging mark, peculiar style of "Juzu" Hamon and Nakago. Also the workmanship of KANESHIGE had been initiated to Senjuin MORIKUNI 千手院盛国 in the same school. 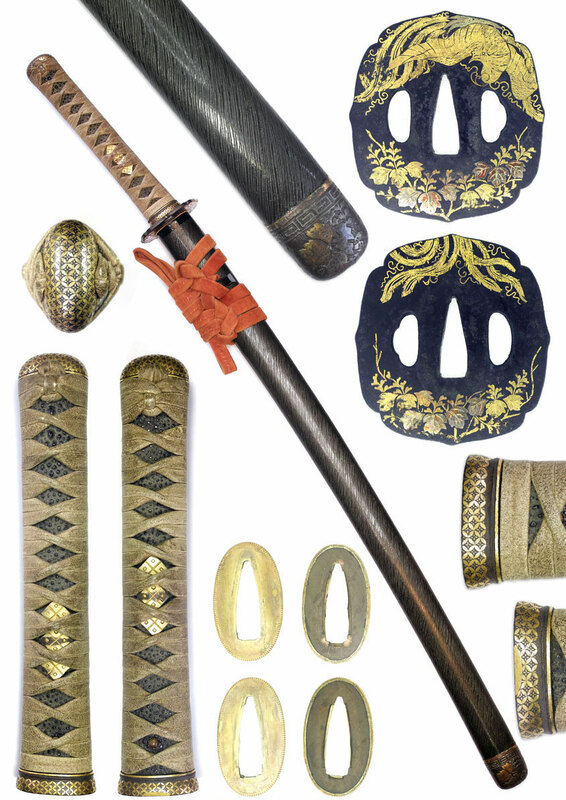 It is noteworthy that considerable number of his swords were performed cutting test and result gold inlay proved by the official swordmans of the Tokugawa Shogunate, the parent Yamano Kaemon NAGAHISA 山野加右衛門永久 and son Yamano Kanjuro HISAHIDE 山野勘十郎久英 to deserve great prizes of supreme sharp cutting performances. He mostly worked in capital Edo as one of the greatest works in heyday Kanbun era (1661-73). It is noteworthy that there are some extant collaboration works with prominent makers of YASUTSUGU 3rd in Edo 江戸三代康継 and Houjouji MASATERU 法城寺正照. Hilt : Black lacquered layskin, fumigated leather lozenge wrap Copper ground silver foiled Shonai-style habaki, preserved in Shira-saya plain wood mounting.